Acupuncture consists of placing ultra-thin needles on various points on the body to help re-direct the flow of blood and Qi (energy.) Pain and disease occur in areas where blood and energy get blocked and stagnate. 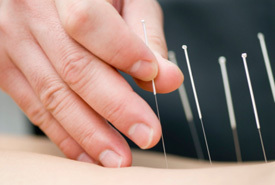 When acupuncture points are stimulated, it helps to unblock these areas to restore health. Acupuncture is used to encourage natural healing, improve mood and energy, reduce or relieve pain and improve function of affected areas of the body by booming the patient’s immune system to achieve self-healing instead of drug. Acupuncture has been in existence for over 2000 years. It consists of placing ultra-thin needles on various points on the body to help re-direct the flow of blood and Qi (energy.) Pain and disease occur in areas where blood and energy get blocked and stagnate. When acupuncture points are stimulated, it helps to unblock these areas to resolve pain, prevent disease, improve immune function, and restore the overall balance of the body. To explain how acupuncture works in a modern western medical sense; acupuncture helps to stimulate the healing mechanism in the body. When an acupuncture needle is properly placed, it activates the nervous, immune, and endocrine systems. It activates the nervous system to release endorphins (a hormone produced in the brain that relieves pain and produces a feeling of well being or happiness,) norepinephrine (a hormone that is responsible for alertness, memory and concentration) and oxytocin (a hormone responsible for resting and feeling calm.) Acupuncture also releases pressure on joint structures and nerves which allows better circulatory flow and an overall help for the body to heal and detoxify. With all of these positive side effects, you can see why acupuncture can be beneficial for not just pain – but so many other different ailments as well. Acupuncture can effectively treat conditions such as chronic or acute pain, sports and work related injuries, tendonitis, carpal tunnel, arthritis, headaches, stress, anxiety, high blood pressure, insomnia, PMS, digestive problems, thyroid disorders, and more. Although acupuncture is most known for treating pain there are more than 80 conditions that the World Health Organization has recognized acupuncture is an effective treatment for. Myofascial Trigger Points are among the most common yet poorly recognized managed causes of musculosketal pain, it can also help with pressure reduction. The body to properly form red blood cells, grow tissues, and replicate DNA, it also helps to form myelin sheaths to protect nerve cells and conduct nerve impulses, and lowers homocysteine levels thereby reducing the risk of strokes or heart attacks. The identification and treatment of the muscle groups requires training, it is not just about “getting or giving a shot” or using a pain killer. It’s about restoring muscle function, eliminating referred pain paths, and getting at the source of your pain. If you have chronically tight, painful muscles or specific areas of pain on your body, chances are you have trigger points. If you suffer from an acute injury or chronic pain, sprains & strains, this powerful treatment modality can help you recover faster and reduce pain. Injections are filled with a combination of vitamins, amino acids, sodium chloride and procaine for the ultimate relief of chronic pain, faster healing time and overall well being. Acupoint Injection Therapy helps with pressure reduction, restore nerve system function, reducing the risk of strokes or heart attacks, restore muscle function, eliminating pain. MIC is a weight loss injection to help break down fat, stimulate metabolic functions, provide energy, regulate cholesterol and blood sugar and acts as an antioxidant. The injection is administered into the high gluteus maximus region. We can design a specific weight loss program for you. To assist you in your road back to a healthy weight. Jenny Liu is a Registered Acupuncturist, certified by the society of acupoint injection therapy, she also holds a bachelor’s degree of TCMD in Liaoning University of Traditional Chinese Medicine, China. Being an acupuncturist and TCM doctor for more than 15 years, she exposed herself to big amount of patients from China and Canada. She is passionate about looking after her patients and restoring them to health, as a result, most of her patients became repeated patients as they completely recovered or received significant improvement on their disease. Her area of expertise includes: neck and shoulder pain, lower back pain, sciatica nerves pain, back pain, tennis elbows, insomnia, sinus, arthritis, anxiety, headache, trigeminal neuropathy, shingles, toothache, cold, gastrointestinal disease, obesity, dysmenorrhea, irregular menstruation, side effects of chemotherapy and radiotherapy, etc. Pain Target Therapy treats neck, shoulder, back pains, arthritis, and nerve problems such as neuralgia and sciatica by using electro acupuncture, Point Injection Therapy, and Cupping. For more information, please give our office a call today!